TEL AVIV — Mira Schejter didn’t have a radio. Living on the first floor of her home in Jerusalem, the 15-year-old would sit on her steps every night to listen to the news. One night, sitting on the same steps next to her father, she heard her country declare its independence. Schejter quickly ran to join crowds of people dancing in the streets, but the celebrations were short-lived. Just before midnight on May 14, 1948, the establishment of Israel was announced, as the small country’s founders read its Declaration of Independence in Tel Aviv — just ahead of the official end to the British mandate in Palestine. Meria Rubin sits just out of the morning sun on the back patio of the Maltz house, in Ramat Hasharon, a suburb just north of Tel Aviv, on March 7, 2018. Hours after the announcement, the armies of Egypt, Syria, Lebanon, Jordan and Iraq invaded, attacking with every intent to wipe the infant country from the map, plunging Israel into the first of its wars for survival. May 2018 marks 70 years after Israel declared its independence. But, 70 years after thousands of people danced with strangers in the streets, under a glow of idealistic, patriot hope — some are questioning if the country has lost sight of its founding ideals. The generation present at Israel’s creation saw a Jewish State that came together just a few years after the Holocaust under vigorous, socialist ideals of democracy, equality and human rights. But today’s Israel, with a population increased 10-fold, a booming economy, a robust army, allegations of racial and ethnic discrimination and inaction to Syrian tragedy just miles north, faces critics claiming the state has become arrogant, aggressive and expansionist. Some young Israelis see this a little differently — a consequence of an older generation romanticizing the past. When he leaves his three-bedroom apartment in Jerusalem, Matan Chaim goes to work at the Begin Cultural Center, near the border of the West Bank, as a licensed tour guide. Chaim, working day-to-day in Jerusalem, wouldn’t argue that the romanticized Israel can go missing from time-to-time. Operating under the mantra “live and let live,” Chaim says that amid the problems everyone can see, he still feels an energy throughout Jerusalem and the country. 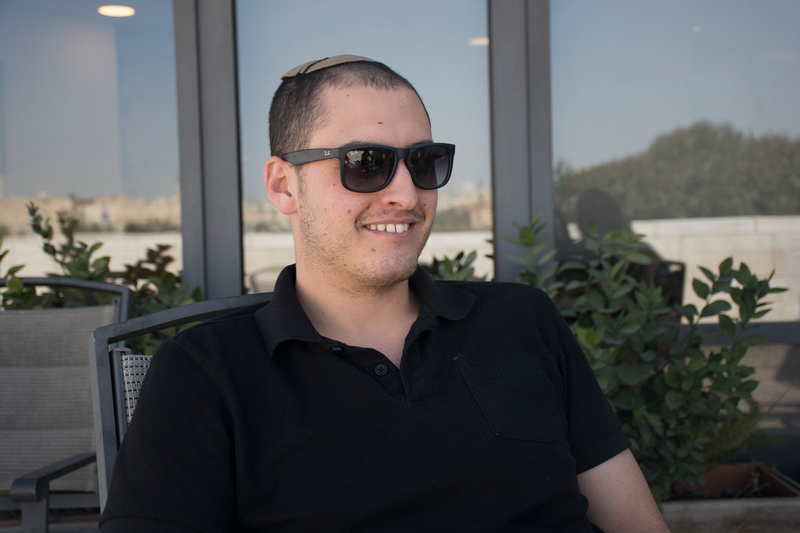 Matan Chaim, 27, talks about being young in a place like Israel, on a deck of the Menachem Begin Herritage Center in Jerusalem on Monday afternoon, March 5, 2018. “I believe everyone around me, being secular or observant doesn’t matter, is still looking for a bigger connection… for meaning,” he said. On Schejter’s back patio, just out of the beating sun of Ramat Hasharon, a suburb north of Tel Aviv, glasses clinked as her daughter-in-law passed iced tea around the table. 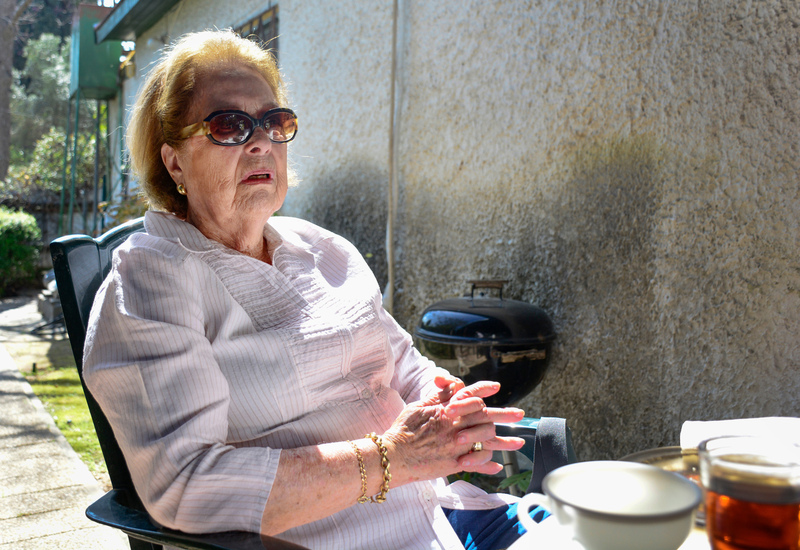 Moments would find Schejter, 85, staring off into space, her eyeglasses catching the sun as she recalled Jerusalem 70 years ago. 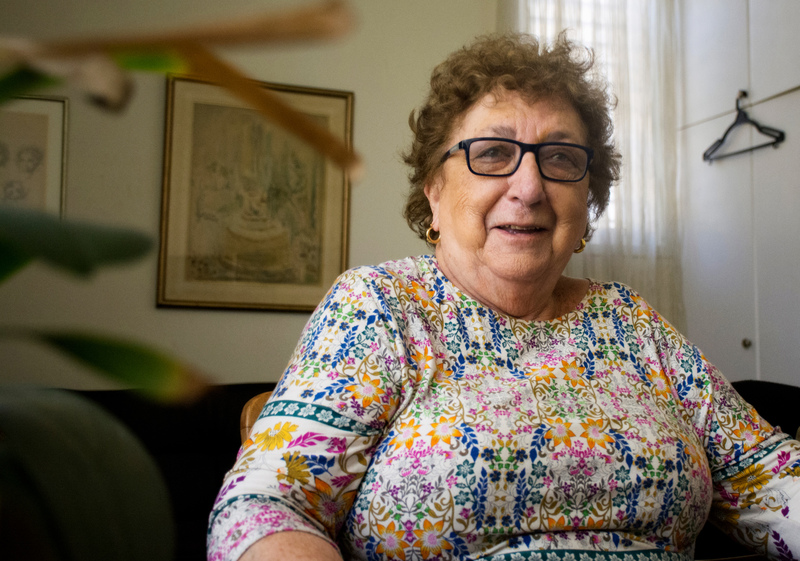 Rubin, also 85, sat just across the table, with crumbs of coffee cake on the plate in front of her, summoning similar memories of Israel’s early years. The country had been at war, outnumbered on nearly every front, and on top of that, there were shortages. Schejter said her father volunteered for a military unit close by and was able to bring food back to her family. Many others went without. Rubin, nearly 40 miles away, led what she called a “normal life” despite the ongoing war — going to school and being in Scouts as a teenager. However, it also included being active in the Haganah — a budding Jewish fighting force before a true army’s existence, later to be dubbed the Israel Defense Forces (IDF). With pride-filled hearts, Rubin and other young students were often sent to paste billboards for the war effort around the streets of the city. But for Emanuel Marx, life during the war consisted of far more than finding food or pasting posters. Unlike like his counterparts on the patio, Marx was born to a Jewish family in Munich, and was among the first refugees to Israel — a nation founded as a safe haven. In 1939, Marx was separated from his family and brought to England with a Kindertransport — a rescue effort by the British government to bring over about 10,000 children from Nazi Germany and other places at the brink of the Second World War. 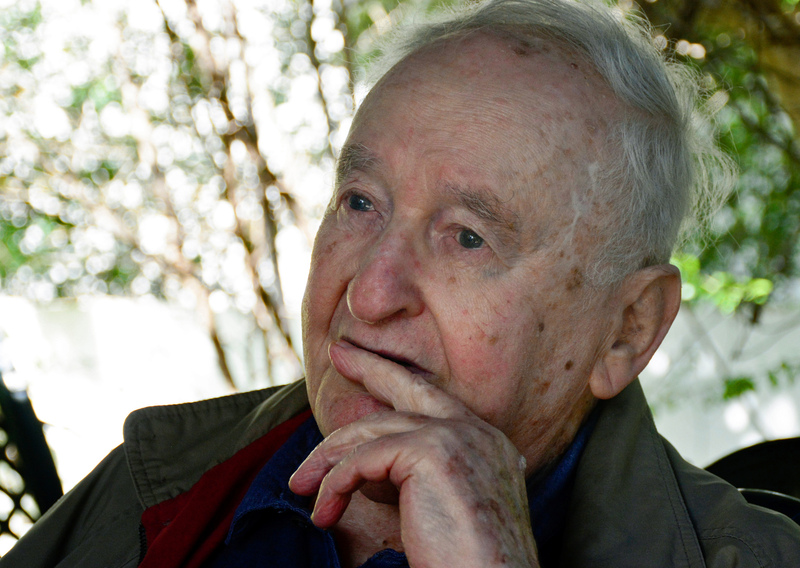 After a year with only his younger brother by his side, Marx made his way to Palestine and joined his parents who, miraculously, had escaped the Holocaust. Emanuel Marx sits in the shade of the Maltz patio, sharing stories stretching back to his childhood and later service in the War of 1948, in Ramat Hasharon, just north of Tel Aviv, on Wednesday, March 7, 2018. When Independence Day came in 1948, however, Marx wasn’t dancing in the streets. Said to be Israel’s deadliest war, over 6,000 Israelis out of a population of about 800,000 were killed, and many more were wounded. But, Marx fought for values he says he doesn’t see today. Instead of a “light to the world,” Marx said, the state has become more like an island. Back in Tel Aviv, the afternoon’s sun slipped through Turkenitz’ window shade and glowed in the small Ramat Efal apartment. Turkenitz, 83, shifted in her chair, dark-rimmed glasses slipping into her curled hair, as she continued her story. The war continued for another year, Israel and the Arab states finally reaching formal armistice agreements in February 1949, and did not claim the life of Turkenitz’ father. At the age of 27, Matan Chaim, the Jerusalem tour guide, is married with one son just over a year old and another on the way. “People enjoy portraying Israel as a point of friction,” Chaim said, taking in the view from one of the Center’s open balconies, sitting at one of a few glass tables in the midday sun. Chaim smiled cooly, with sunglasses resting on his nose and his light-brown yarmulke held in place on his head by two clips. Contrary to how Chaim sees his city and country portrayed, under a seemingly inevitable lens of media intensity, he says violence does not dominate the average day or even the average week. Born in Israel, the youngest daughter of her family at 19-years-old, Ruth Garami also goes to work each day at Jerusalem’s cultural center. With a soft smile resting under deep, brown eyes and a shy demeanor, Garami took notice of the way older generations, like her own parents, can push their ideals on their youth. Ruth Garami, 19, sits on the deck of the Menachem Begin Herritage Center in Jerusalem on Monday afternoon, March 5, 2018. The young adults realize Israel is going to be in the hands of their generations and generations to follow. And they are not naive. Chaim senses that, long term, the nation will move in a good direction. She paused, silent for a moment as she searched for her words, and when her mouth opened again, they returned softly. 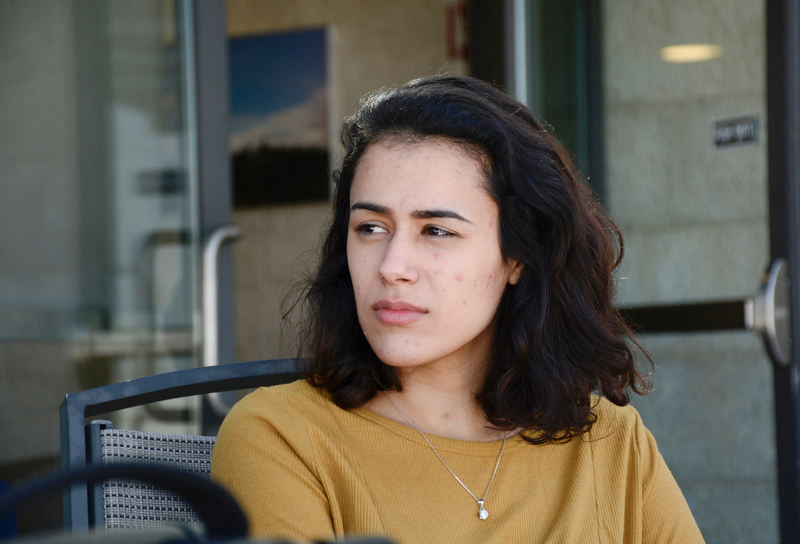 Those on the Ramat Hasharon patio murmured in agreement, noting there are many in Israel who support the current government, although they themselves would like to see with the youth a change in their country’s politics. Marx — a past recipient of the Israel Prize, following his study of social anthropology among communities in the country — said truly he is not happy with today, comparing his government to a mafia. However, amid the somber sentiments of first-generation Israel, the keepsake idealism dating 70 years, as well as newly polished frustrations, optimism persists. Ruth Turkenitz, 83, sits in her apartment in Ramat Efal, a suburb outside of Tel Aviv, on Wednesday, March 7, 2018. Most stray dishes and glasses were gathered in the center of the patio table, and more clearly the birds could be heard for just a moment.